Keep water out of the house. Let water out that gets in. What does drainage have to do with improving energy performance? First, why fix a house that is tearing itself apart? Otherwise, water becomes vapor—and that has to be managed. It’s best to avoid water in places it doesn’t belong. The best way to deal with water is to keep it away from the house to begin with. However, water will get in, so make provision to let drain out. It’s pretty easy to understand the need to keep water away from the house. We’ll talk about that and what to do when it gets in any way. We want it to rain. When it does we want the surface water to flow away from the building without erosion. Ideally, if the surface water drains quickly away from the building, the only water at the foundation would be ground water. However, rain water draining at the foundation adds to the ground water. Ground water pressure against the foundation is called hydrostatic pressure. It’s responsible for quite a few unwanted things. Water collecting at foundation walls can evaporate to the inside of the foundation as well as leak through it. If enough water collects at the foundation, it can cause it to collapse. Friends in cold climates have an additional thing to worry about: freezing. Freezing water expands 10% to put 40,000 psi of pressure on the foundation. Is it any wonder the foundation fails? To avoid ground water buildup up at the foundation, strategies using footing drains and at least dampproofing are used. This is what most of us think of when we think of our house with respect to rain. Water flows off the roof. Walls get wet, but siding sheds it to the ground by the foundation. Eaves are great for minimizing the amount of water striking walls. They’re also great for pushing roof water away from the foundation. The first thing people think about for handling roof runoff is gutters. They work, but they create problems too. I think there is a better way. The fundamental principle of rain water control is to shed water by layering materials to direct water downward and outward. Roofing and siding are the first line of defense. For drainage, assemblies are typically roofs, walls, and foundations. Rain gets into all of them. 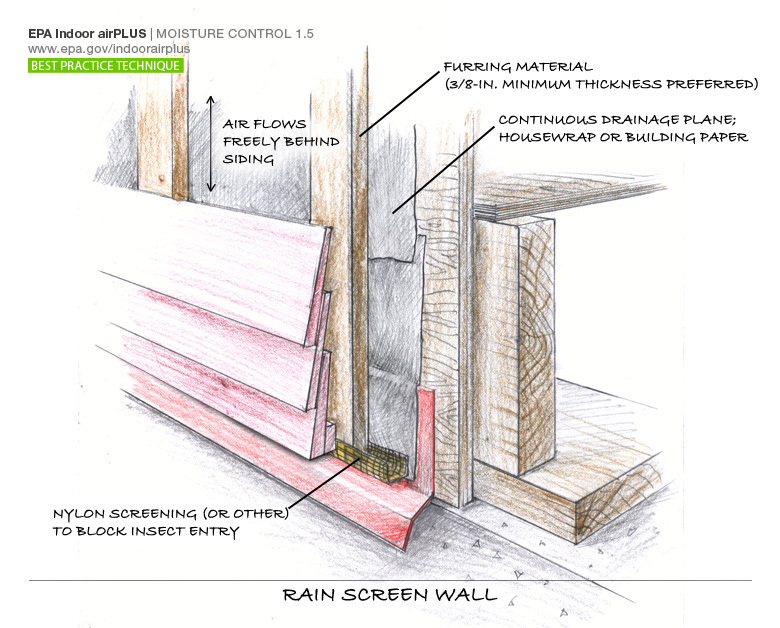 Rain penetration into and through building surfaces is governed by capillarity, momentum, surface tension, gravity, and wind. Openings typically are rough openings for windows and doors. House wrap is stretched around the frame. Corners are protected with sill pans or bitumen tape. Components include things in assemblies, such as windows, doors, and skylights. The most common place water gets in is where sills meet jambs. The biggest reason is this joint is almost always unsealed. Drip edge helps keep water out of the top of the component. Draining the material depends on what it is. Any material that gets wet needs to dry. The best way is to let water run off of it so it doesn’t get absorbed. Do what you can to let water run off, then install it such that it can dry when it does get wet. In my experience, it best to follow the manufacturer’s instructions and recommendations. When it comes to rain and groundwater drainage . . .
Don’t forget to heed our warning . . . WARNING! Do not implement any of these solutions without considering the impact on IAQ, moisture control, & heat transfer. A combination of solutions are usually needed to improve health, building durability, comfort, and energy efficiency. Ignoring this warning may lead to disease, deterioration, high energy bills or worse!